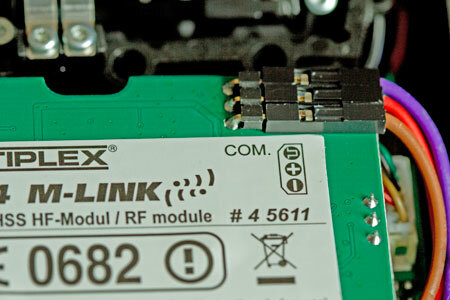 Of course you need a transmitter with Multiplex® M-Link hf module. If is important that the hf module has installed the latest firmware (0.44). With the Multiplex® "USB PC-Kabel RX+S (UNI)" (Article no. 85149) you can update the hf module. Instructions can be found in the download area on www.multiplex-rc.de. There is a mistake in the update instruction. To update the hf module it is important to hold the tools key while switching on the transmitter. The current firmware version of the hf module is shown for a short time after power on in the 2nd row of the display. The last 3 digits have to be "044" to be compatible with souffleuse (and the Multiplex telemetry display). The image on the right side show how it should look. The important part is marked in red. Transmitting telemetry data from the transmitter (hf module) to the android device is done with a simple serial bluetooth converter. You can use any converter that uses signal levels of about 3.3 V and works with a power supply of 3,3 V. Normally those converters are specified to work from 3,6 V to about 6 V but i found that the converters have no problem with a slightly lower voltage. You should find those converters on eBay®. Many, mostly chinese sellers, sell this little devices for less than 10 Euros. If you prefer to buy in Europe: Flyduino has preprogrammed converters that fit directly into this project without any configuration. This is how the back of such a converter looks like. Depending on your seller there are different versions that are delivered with or without patch cables. Normally the modules are configured to a baud rate of 9600 baud. The Flyduino module is already set to 115.200 baud. Other modules need to be configured like i tried to describe here. If you use an "exotic converter" you have to consult the manual that hopefully is provided by your seller. Some converters exchange TXD and RXD as "transmit" and "receive" is always dependend on the side you look from. 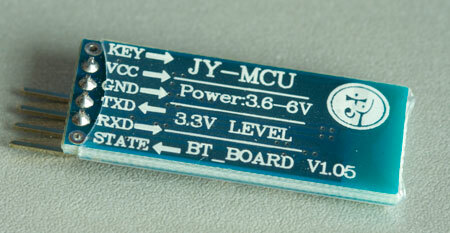 If there are arrow symbols printed on the pcb you should use the pin that points inside the converter. In the example converter on the picture this is RXD. If you power on your transmitter a single led should light or blink on the converter. Fine. You're done. 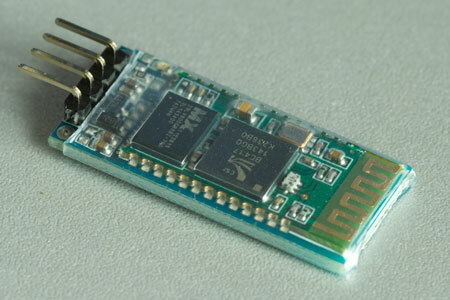 Look for a place inside the transmitter's box where you could store the bluetooth adapter. I prefer a place as far away as possible from hf module and antenna. 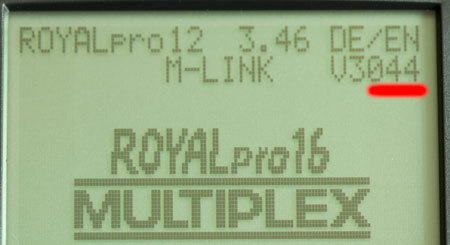 If you own a royal pro a nice place is (looking from below) the left side of the battery.